Do you ever get ideas but have no idea how to make them a reality? So imagine my delight at having children who are just SO much more competent than I am! As a result, I am finally going to have something I've been desperate for for about 7 years. Due to the fact that the one sheet cost $3.99 and the cheapest possible shipping I could get was $5.04, I chose the cheapest possible shipping and now have to wait 14 days. But what's 14 days after the approximately 7 years I've already waited? As soon as I have them, I'll show you! And then the really fun thing is that if you want a signed copy of one of my books but you live in Kamchatka or somewhere that is not right around the corner from me, you can simply purchase the book from your favorite bookseller, email me with who/how you want the book signed, and I can mail you a book plate just how you want it and you can stick it right in! Voila! An idea has become reality! Now then. Are you ready for today's pitch? The Pitch: CRUNCH! Broccolilocks has a GIANT appetite for her prized vegetable. MUNCH! But a mysterious stink leads her nose down the garden rows to find that something has been munching on her broccoli! Julie is looking forward to your thoughts on her pitch! I am looking forward to when my bookplates arrive! Did I mention that I have 5 different ones? So awesome! :) I can't wait to show them to you! I too, have been meaning to make book plates for years... Can't wait to see yours! Now would you please explain Julie's strange phalanges? Of course I would read Broccolilocks! I love the title! It's not clear to me who is making the crunching sounds Broccolilocks or the stinky critter (skunk?) But I do love the sounds! Maybe she could just clarify that a bit. Also, I would take out the "But" after "Munch." And then i'd add a final short sentence giving a hint to the plot. And, assuming this story is based on Goldilocks and the three bears, it might be fun and effective to add something like: "Who's been munching on my broccoli?" Hope this helps! I can't wait to read the story! 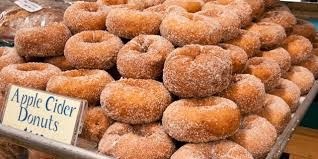 Apple cider donuts. Now that is interesting. And I've wondered what book plates are for so that is something for me to check out. Yes, I would read today's pitched story. I am a little curious of the stakes for the PB but the way it is, with a little tweaking advised from the ever-wonderful Iza, really piques my interest. Congrats on your bookplates! Very cool! Mmm, those donuts look delicious! And Julie, yes, I'd read your book. Love the title! I like the pitch so far, but maybe u could add a little more to it to show what Broccolilocks is going to do about her problem. You basically said everything I was planning, Tina! Looking forward to seeing the bookplates, Susanna. Julie, I was going to suggest adding one more sentence to show how the story/Broccolilocs evolves. Good luck! I've been looking into bookplates, Susanna. Where did you order them from? Yes, I would read this story! The title itself is intriguing and I love fractured fairy tales...very clever! Can't wait to see your bookplates, Susanna. I ought to show my book trailer soon it's really tongue in cheek ha ha ha haaa! I've read this cute story and this is a great pitch for it, Julie. I wonder if you need to hint at what happens next though without a rhetorical ? I would read Broccolilocks, but I would suggest changing the title. I expected a story about someone who had vegetable hair. Julie: AWESOME voice in your pitch. It's a yes from me, with the same advice as the others to add one more sentence. I also found the name hard to say, and am not sure how easy this would be for a read-aloud? Yes, a cute and catchy pitch! The bookplates sound like a very smart idea, Susanna. I hope they're FAB when you receive them! Sure, I'd read it, Julie, and agree with Tina and Pam on improving it just a bit. Congratulations on your bookplates! I covet them too!! I have to give the pitch a maybe because I felt the title set us up for a story about a girl who has or ends up with broccoli for hair. The pitch, however, seems more about a girl who solves a mystery. I THINK it's a twist on Goldilocks where something is eating the broccoli instead of porridge, but I need a little more clarity. I can already see your amazing illustrations for this story though!!! Keep at it! Thanks, Iza. Already revising, and your ideas are giving me ideas that I want to add to the illustrations! I like hearing the same advice - makes my decision easy when all agree! Thanks, Kirsti. Writing one is fun - esp. when there are so many good ones to 'research'! Thanks, Catherine. But did you mean through - or without? Glad you mention the hair - it does play a role! Thanks. Now you have me wondering how you would pronounce it, Joanna. Susanna - looking forward to seeing your BP design. I made them for Xmas presents one year - maybe I need to make one for myself! Morning Susanna! Those donuts would go great with my coffee! I would definitely read BROCCOLILOCKS. I have a three-year old granddaughter who loves broccoli, it's not her favorite vegetable, it's her favorite food! I can just imagine her with broccoli locks and a little basket over her arm. I think the MUNCH and CRUNCH really add to the flavor of the pitch. I read an early draft of this super-cute story and would read it again! I really like the poetry of the pitch, but think it needs one more sentence to give us another hint of the plot. I ditto what Iza said, basically. And Susanna, yay for bookplates! I Iike the mystery of what's happened to the broccoli and love the crunchy language! The one thing I wonder is whether this story has some hidden message about eating your veggies, which would make think twice about it. But I do like the twist on Goldilocks. Now I want a donut too! I would read the story, but I do think the pitch needs to give a better clue about Broccolilocks. At first I thought she might be a giant, then I thought she might be just an oridinary child, so I am not certain how to picture her. I like the "CRUNCH and the MUNCH". I love the humor in this pitch and also the mystery. Hmmm. Do skunks also love broccoli? I will just have to read this one to find out. Great pitch! Haha! It was my son's too! Thanks, Juliana. You're safe on the didactics, Andrea! Yes! I would love to read it because I love all things broccoli. I did have a lot of questions though. Is the prized vegetable broccoli? If so, why does she have to go away from it to find the broccoli-eater? I think I just had a hard time visualizing what was going on. I loved the conciseness, but maybe a more robust setting/character set up? So I can see what's going on? I like the sharing of what the pitch conjures up in everyone's minds! And I'll be sure to add another sentence. Thanks, Wendi. Thanks for your thoughts for Julie, Pam, and I can't wait to show you the bookplates... 14 days....! Thanks for your thoughtful suggestions for Julie, Catherine! And what book trailer??? I want to see it!!! Thanks for your thoughts for Julie, Donna, and for sharing this post out in the world every week - you're so nice about that! - and for the good wishes for my book plates! Golly. 14 more days!!! Morning Juliana! Please help yourself to as many donuts as you like to go with your coffee! :) Thanks so much for chiming in for Julie! Thanks so much for your thoughtful comments for Julie, Andrea! Thanks for sharing your insight, Wendy, I'm sure Julie will find it helpful! Yes I would read it! Julie, I'd love a little more drama and tension in this pitch. Is the skunk eating ALL of it? Is it a matter of survival for Broccolilocks? Is she entered in the big broccoli contest and now is not the time for a pest? Your pitch definitely has me curious, Julie. It's very funny and catchy, like a logline should be. But I too would like some clarity, esp. now you've told us veggie hair plays a role. I actually love this pitch and might take the book home without looking through it first. It sounds like it's going to be hilarious and cute! Is Broccolilocks a bunny? It sounds like she's eating right out of the garden, like a bunny. This seems like a cute, age appropriate mystery, so yes, I would read it. I would love to know more, though, so I think the pitch needs to be fleshed out some. Hardly needed to read the pitch. I would buy the book just on the title! Brilliant mental picture. Yay! Glad you're book plates are on the way to becoming a reality. And, yes, please . . . I'll have an Apple Cider Donut. My fave! Yes I would read it. Sounds like great fun! Looking forward to seeing your book plates, Susanna. I've never had an apple cider donut but you have me curious now! Glad to help Julie. I love your illustrations and look forward to reading your stories too! But neither you or Julie answered my phalanges question. I am intrigued! Sounds good to me! I think this is great! I like the CRUNCH! and the MUNCH! sounds! :) And, YAY on the bookplates! I'm sure you've made Julie's day! :) Thanks for chiming in, Steve! Thanks for your helpful thoughts for Julie, Genevieve! I thought Broccolilocks was a girl... but Julie will know for sure :) I'm sure she'll answer when she's back from her hike! Thanks for your thought-provoking questions for Julie, Lauri! I'm sure she'll find them helpful! Thanks, Wendi. Great questions for me! More great questions, Lauri. These make me understand what I need to reveal a lot better. Thank you. Thanks for your kind words, Beverly! Glad to see fans of funny here too! Some of the questions here are making me laugh, but showing me what I need to show! Thanks, Genevieve. Thanks for the encouragement, I'll be sending your email to my husband so he can sell you a car, Steve. Porsche, Audi or VW? Thanks, Cally. Great name, by the way! Love your enthusiasm, as always! Good luck with your contest piece, Vivian! Thanks, Stacy. Love that there is an overall concensus about that extra sentence, but everyone's confusion makes it clear to me what I need to add. I would read it Julie--who wouldn't be curious about the mysterious stink?! I would read it based on the title too. If do think that the pitch is ambiguous and would really like some clarity or some more of a plot clue. Is the broccoli muncher she finds a friend or an enemy? It's unclear is Broccolilocks is human or not, I agree that it sounds like she has broccoli hair! I really love anything that promotes healthy eating habits with children, and this really makes broccoli so much fun! Can't wait to read it, great work! Thanks, Lyla (another pretty name! ), these comments are really helpful. And yes she has broccoli-styled hair! I don't know who might come back to look in the comments - but I REALLY appreciate all the help with the missing elements in the pitch! So grateful for the opportunity, Susanna, and the amazing participation from your readers! Sorry, Iza! It's the pattern of bones in your hands or feet - we all have them, well, at least most of us! Ah, so it's nothing unusual...Phew! Me! I came to read the comments...but I didn't come back...it's just that I took a while getting here for my first visit. I've been saving this in my email. Can't wait to see your bookplates, Susanna! Exciting! You were so sweet to save the email and come back to help Julie, Penny! :) And I can't wait to show you the bookplates. I hope everyone else will like them as much as I do! Hahaha! That happened to us in a house we stayed in in France when i was 7... only it was a dead water rat under the dishwasher!